Here is 'lunchbox recipe' I love to prep on a Sunday, ready for me to enjoy in the working week! If you get into a good routine and put some time aside to prep meals each week, you won’t believe the help and joy it will bring you when you feel you're too busy or can't face cooking in the kitchen! If you are new to prepping, or struggling to get into a good routine - don't worry - It can take a little practice! Start by doing one batch cook of something you've either made before and love, or try a totally new recipe that tickles your fancy ....and see how that meal helps you! Did you know quinoa is actually a seed, not a grain!? According to research, the Incas believed that quinoa increased the stamina of their warriors and I'm not surprised really when you hear what quinoa contains! Quinoa is rich in protein, fibre, riboflavin (vitamin b2) and magnesium. In addition to this, quinoa contains iron which helps keep our red blood cells healthy and helps to transport oxygen throughout the body. It also contains lysine which helps to build and repair tissue!! 1. Cook the quinoa following pack instructions but cook to taste. I tend to reduce cooking time so that the quinoa has a bit of a crunch to it. Leave the quinoa aside to cool in a bowl. 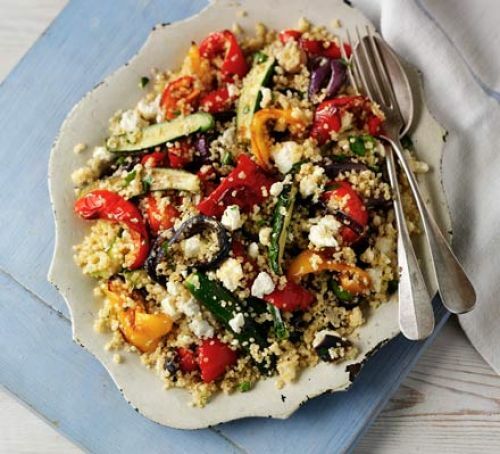 Alternatively, if you have a pre-cooked pack – tip all the quinoa into a large bowl. 2. Heat oven to 200C/180C fan/gas 6. Toss the onion and peppers with a drizzle of Rapeseed oil and seasoning on a roasting tray, then roast for 15 mins. 3. Toss the courgettes and garlic with the rest of the veg and roast for another 15 mins. 4. Squeeze the roasted garlic cloves out of their skins and mash with some seasoning. Stir in extra virgin olive oil, lemon juice, zest and season to taste. I sometimes like to add chilli or other herbs to make it richer. Mix quinoa and roasted veg together with parsley. Crumble over the feta, toss gently again. sprinkle a load of mixed seeds......BEAUTIFUL! This makes about 4 portions for lunch! Put into plastic lunchbox containers in the fridge, ready to enjoy over the next coming days. In the morning, I like to put a handful of fresh Rocket leaves on top for extra crunch and colour! Drizzle a bit of balsamic glaze to enrich it :) .........oh yeah! I know what I'm prepping this Sunday :) Have a great weekend team.